We are facing a global health crisis! Health surveys show that the incidence of chronic diseases such as heart disease, cancer, and diabetes is higher than ever before. This can be attributed largely to the state of our diets that are woefully inadequate in nutrient-rich whole foods. The reality is that most of us have turned the healthy food pyramid upside down - too much of the wrong food, not enough of the right food! 90% of us don't eat the recommended 5-13 servings of fruits and vegetables. 70% of us admit to eating foods that actually contribute to poor health. Less than 1 serving of whole grains are consumed on a daily basis - many don’t even get that. Protective lipids and sterols have been stripped from whole grains to increase their shelf life. Many don’t eat fish due to concerns about the presence of heavy metals and contaminants. Turn your wellness pyramid right side up! Leading global health authorities like the World Health Organization, Centers for Disease Control, and American Heart Association agree that good nutrition plays a critical role in lowering the risk of heart disease, stroke, cancer and diabetes. Everyone should increase consumption of whole-grain foods, fruits and vegetables, and foods rich in omega-3 fatty acids - and maintain a healthy weight. But even those with good intentions to eat a healthy diet face challenges. Busy lifestyles, eating on-the-run, and the prevalence of processed foods all contribute towards nutritional gaps that would benefit from nutritional supplements. Whole-food nutrition clinically proven to strengthen the perfect foundation for lifelong health and vitality. Includes three scientifically-proven products: Tre-en-en, Carotenoid Complex, and Omega-3 Salmon Oil Plus, providing key nutrients from whole grains, fruits and vegetables, and fish. Pro Vitality’s whole-food nutrition is the core supplement for healthy nutrition for adults at any stage of life! 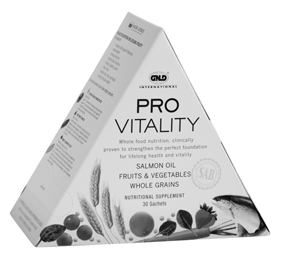 GNLD Pro Vitality supplements provide the finest natural nutrients from whole grains, fruits and vegetables and fish to help you achieve optimal health. These nutrients are delivered in highly bio-efficient forms in exclusive, clinically proven formulas that maximise nutrient absorption, utilisation and benefits by using the most advanced scientific methods and proprietary processes. Feed your cells - energise your life. Good nutrition begins at the cellular level. Tre-en-en is the world’s first and only whole grain lipids and sterols supplement proven to enhance energy and vitality by optimising cell membrane function. It energises your entire body by helping your cells function more efficiently. Protect your cells - optimise your immunity. With the protective power of carotenoids from carrots, tomatoes, spinach, red bell peppers, peaches, strawberries and apricots, this patented formula is the result of over 10 years of research and development. 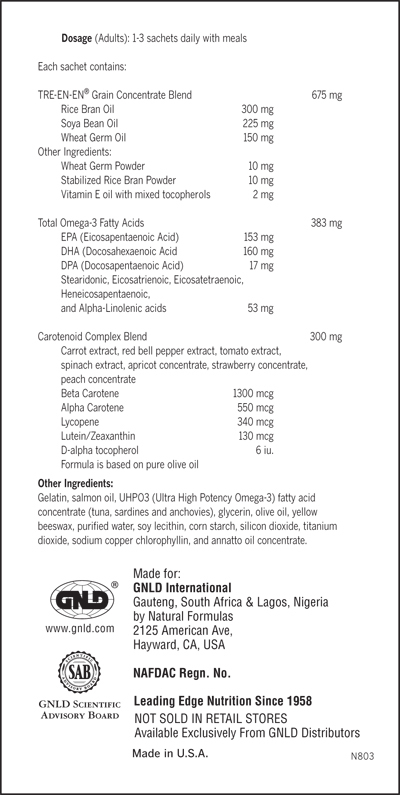 Carotenoid Complex is the world’s first and only whole food supplement clinically proven by USDA researchers to protect your heart, defend your cells, and boost your immune power. Balance and regulate your cells - maximise your good health. The world’s first complete fish oil supplement with guaranteed potency of all eight members of the omega-3 family. 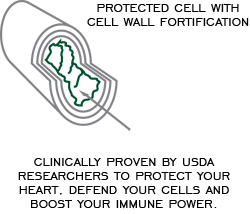 Recent human clinical trials proved its bioavailability to support heart and cardiovascular health, as presented at Experimental Biology 2008. Plus, GNLD’s fish oil sources are screened for more than 160 potential contaminants with an allowable detection limit of zero, so they are guaranteed pure!